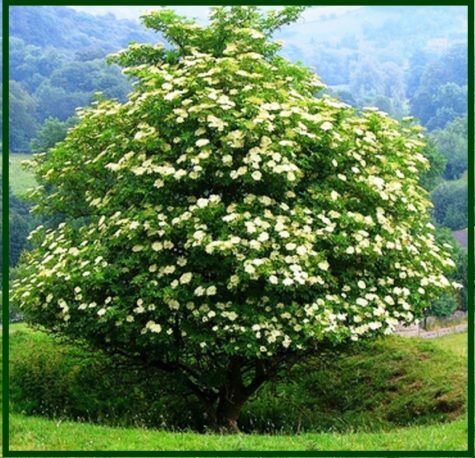 The elder tree grows in Britain and from Scandinavia to the coast of Africa, a twisted, shrubby tree, seldom more than 30 ft high and common in hedgerows and waste places. The strong smelling leaves are divided into broad leaflets, creamy flowers grow in sweetly scented clusters in midsummer and in the late summer black juicy berries ripen and fall. The bark and leaves of the elder have a violent purgative action when taken internally and are not safe. However, used externally, the juice of the leaves is cooling, soothing and healing and thus has been a common and efficient domestic remedy for several thousand years. The inner bark is collected from young trees in the autumn and is best sun-dried. It is diuretic, a strong purgative and in large doses emetic. It is used in the treatment of constipation and arthritic conditions. An emollient ointment is made from the green inner bark. The pith of young stems is used in treating burns and scalds. A homeopathic remedy is made from the fresh inner bark of young branches. It relieves asthmatic symptoms and spurious croup in children. 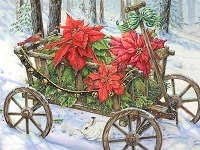 The leaves are used primarily for bruises, sprains, wounds and chilblains. The leaves can be used both fresh or dry. The leaves are purgative, but are more nauseous than the bark. They are also diaphoretic, diuretic, expectorant and haemostatic. The juice is said to be a good treatment for inflamed eyes. An ointment made from the leaves is emollient and is used in the treatment of bruises, sprains, chilblains, wounds etc. It has been reported that Elder Leaves may be useful in an ointment for tumors. 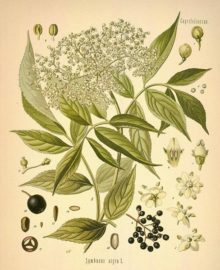 The flowers are the main part used in modern herbalism, Elder flowers are ideal for the treatment of colds and influenza. They are indicated in any catarrhal inflammation of the upper respiratory tract such as hay fever and sinusitis. Catarrhal deafness responds well to Elder Flowers. The fresh flowers are used in the distillation of “Elder Flower Water”. The flowers can be preserved with salt to make them available for distillation later in the season. The water is mildly astringent and a gentle stimulant. It is mainly used as a vehicle for eye and skin lotions. The dried flowers are diaphoretic, diuretic, expectorant, galactogogue and pectoral. An infusion is very effective in the treatment of chest complaints and is also used to bathe inflamed eyes. The infusion is also a very good spring tonic and blood cleanser. Externally, the flowers are used in poultices to ease pain and abate inflammation. Used as an ointment, it treats chilblains, burns, wounds, scalds etc. 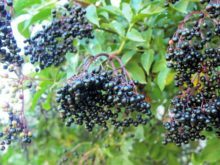 Elder Berries have similar properties to the Flowers, with the addition of their usefulness in rheumatism. The fruit is depurative, weakly diaphoretic and gently laxative. A tea made from the dried berries is said to be a good remedy for colic and diarrhoea. The fruit is widely used for making wines, preserves etc., and these are said to retain the medicinal properties of the fruit. The root is no longer used in herbal medicine but it formerly had a high reputation as an emetic and purgative that was very effective against dropsy. The pale, aromatic inner bark of the Slippery Elm tree is considered one of the most valuable remedies in herbal practice, the abundant mucilage it contains having wonderfully strengthening and healing qualities. It can be used to make a soothing, healing medicine for sore throats, coughs, bronchitis, catarrh and stomach and bowel troubles. It also acts as a treatment for cystitis and urinary complaints. 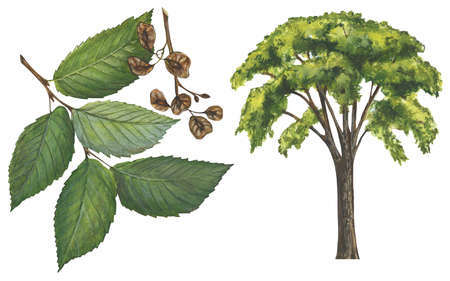 People take slippery elm for coughs, sore throat, colic, diarrhea, constipation, hemorrhoids, irritable bowel syndrome (IBS), bladder and urinary tract infections, syphilis, herpes, and for expelling tapeworms. Because Slippery Elm bark is a soothing nutritive demulcent, it is perfectly suited for sensitive or inflamed mucous membrane linings in the digestive system. It is used for protecting against stomach and duodenal ulcers, for colitis, diverticulitis, GI inflammation, and too much stomach acid. Slippery elm is also taken by mouth to cause an abortion. It is often used as a food during convalescence as it is gentle and easily assimilated. In diarrhea it will soothe and astringent at the same time. Externally it makes an excellent poultice for use in cases of boils, abscesses or ulcers. Slippery elm is applied to the skin for wounds, burns, gout, rheumatism, cold sores, toothaches, sore throat, and as a lubricant to ease labor.